This post shows how to cook black beans in a pressure cooker or Instant Pot. In about 15 minutes, you can have toothy tender, rich, earthy, meaty, ready-to-enjoy beans, all soupy in a nutritious cooking broth. 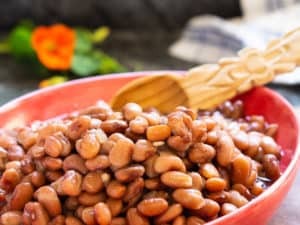 Cooked from scratch, dried beans become pot beans, frijoles de olla, with delicious pot “liquor.” Canned beans in salty liquid don’t even come close to freshly cooked beans and their broth. And it happens fast in the Instant Pot or stovetop pressure cooker. 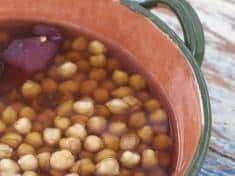 If you wish, when the dried beans go in the pot, season them with a mild dried chile, garlic cloves, and/or chopped onions. If you have less than perky parsley or cilantro, throw that in the pot too. Mexican cooks add epazote to their beans. Epazote is a pungent green herb with “gas-relieving” properties. Speaking of farts, we are sometimes advised to soak dried beans before cooking, to make them more digestible. Which brings up the back and forth question—do we soak the beans before cooking or do we not? And there’s the why soak the beans if you use a pressure cooker? Another question: With a pressure cooker, do we turn off the heat and let the pressure come down naturally, and for how much time, or should we “quick-release?” Both work, with slightly different cooking times. Author Michael Ruhlman sought out answers to these cooking questions and found more than one food “expert” with differing thoughts about soaking and salting beans. Yet, there’s not much written about the beauty of pressure cooked beans. 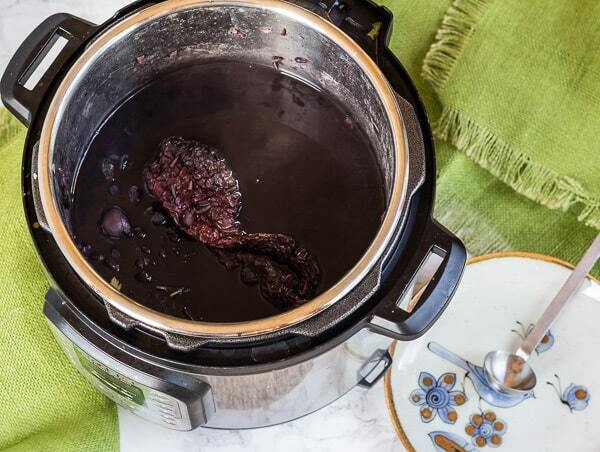 One thing’s for sure, pressure cookers reduce cooking time and fuel energy. For cooking beans, they’re awesome tools! To cut the pressure-cook time by half, soak the beans–cover dried beans with water and let them soak at least 6 hours or overnight. Let the pressure release naturally. Soaking and natural pressure release rewards with best bean texture. Salt when the beans are done, with good quality salt. Now those opinions are all fine and dandy, but the fact is, I’m not that good at planning ahead for dinner. What about you? *** !!! Bottom line, if you want tender black beans in about 30 minutes, skip the soaking, and quick release the pressure! When is a pressure cooker up to pressure? With the Instant Pot–make sure the vent is in the sealed position, use the Manual setting and set the cooking time. When time light comes on, it’s up to pressure. With a stove-top pressure cooker–heat on high flame until the steamy jiggle noise begins in earnest, then turn the heat down just so it maintains pressure, then start your kitchen timer. What are approximate cooking times? Once the cooker is up to pressure, soaked black beans, with the pressure released naturally, take about 6 minutes to cook. Soaked black beans with quick release, cook in about 9 minutes, once the cooker comes to pressure. Beans not soaked and pressure quick-released, cook in about 20 minutes, once the cooker comes to pressure. 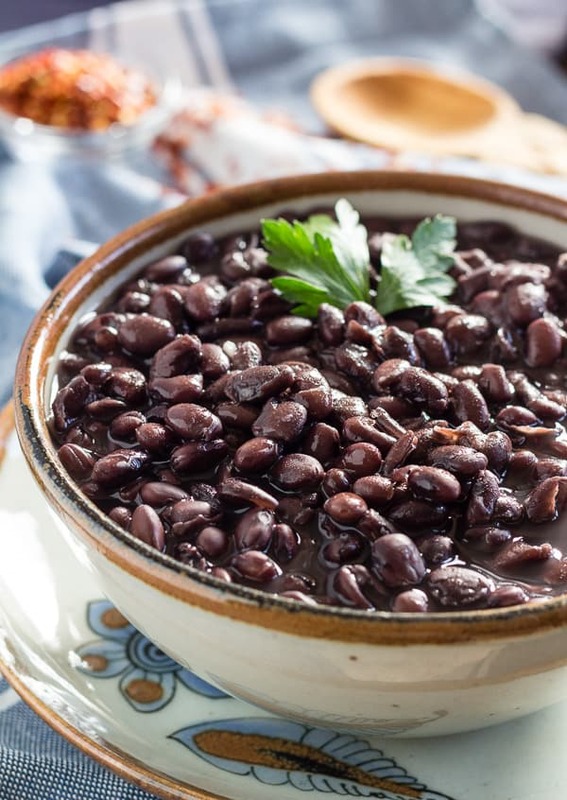 Without a pressure cooker it takes about 2 ½ hours to cook black beans until the beans are tender. Other smaller dried beans like navy or cannellini, cook about the same as black beans. 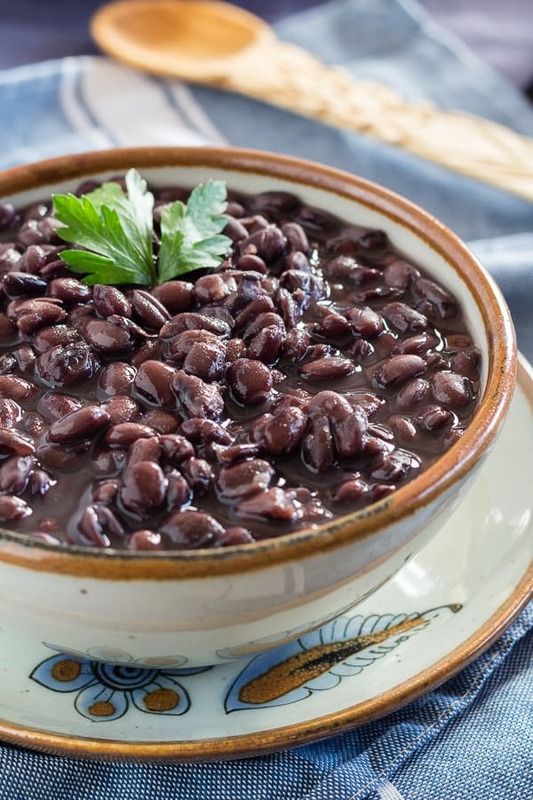 What can you do with your pressure-cooked black beans? Use the broth (pot “liquor”) as an excellent soup base. Add black beans to your favorite salad. Make refried beans: mash leftover beans into sautéed onion with some of the pot broth. Delicious with breakfast eggs. Make it a fabulous week–get in the kitchen and cook something delicious in your Instant Pot or pressure cooker! The Instant Pot link is an affiliate link. When you purchase products via my links, it doesn’t cost you anything and I earn a tiny commission, which helps me continue to provide free content here on Letty’s Kitchen. Thank you!! 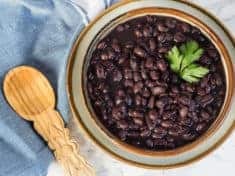 The pressure cooker or Instant Pot is your tool for perfectly tender black beans, ready for you next meal. Actual cooking time depends on whether you presoak the beans, and if you let the pressure come down naturally or quick release the pressure. 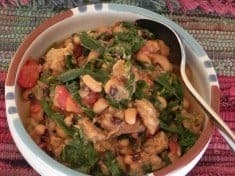 This recipe makes about 4 ½ cups cooked beans and 3 cups delicious broth. Rinse and pick over the beans, looking for little stones that might be masquerading as beans. *** If you soak your beans, put them in a bowl and cover with a couple inches of water and let soak at least 4 hours. Drain and rinse again before cooking. 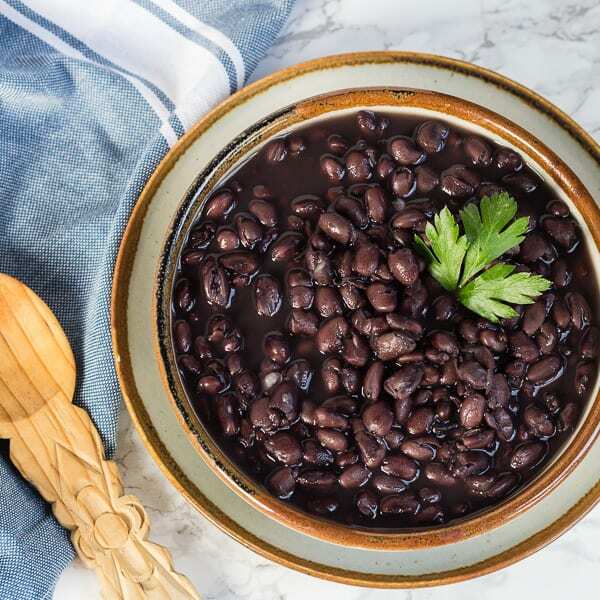 Soak or unsoaked, put the rinsed beans into the pressure cooker or Instant Pot. Add any aromatic options. Season to taste with more salt if you wish. Test a bean to make sure it’s tender to your liking. If the beans need to cook more, bring to pressure again for a minute or so. Quick release the pressure. You’re there—perfectly cooked black beans for your next recipe. Once the cooker is up to pressure, soaked black beans, pressure released naturally, take about 6 minutes to cook. Once the cooker is up to pressure, soaked black beans, pressure quick-released, take about 9 minutes to cook. Once the cooker is up to pressure, beans not soaked and pressure quick-released, take about 20 minutes to cook. I soaked my beans last night for 11 hours and today I found your recipe and I cooked for 6 minutes and they came out perfect. I can’t believe that the first time I’ve ever cooked beans on my own they came out so amazingly well. So thank you very much for an easy-to-follow recipe that turned out so well.